Publisher Ysbryd Games has revealed that VA-11 HALL-A: Cyberpunk Bartender Action will be pouring onto the Nintendo Switch eShop next month. Described as a "booze 'em up about waifus, technology, and post-dystopia life", this one has already gone on to sell 300,000 copies on Steam. It's set in a cyberpunk future, where capitalist forces drive the corrupt government of Glitch City, a place known for both rapid advancements in technology and a disregard for the ethical quandaries of nanomachine experiments on the general public. It has also been confirmed that Limited Run Games will produce physical editions for both Nintendo Switch and PS4; Switch is also getting a special Collector’s Edition boxset. Further details on these physical editions will be announced later this year. 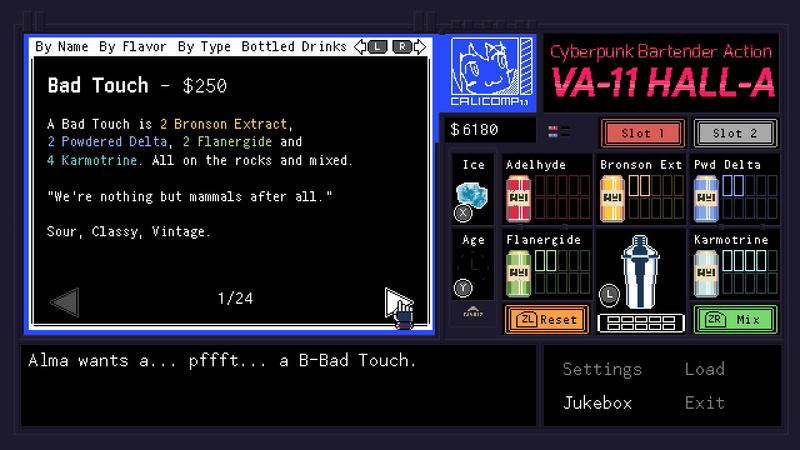 VA-11 HALL-A: Cyberpunk Bartender Action launches on Switch on 2nd May and will be available for $14.99. Are you excited to get your hands on this one? Will you be waiting for the physical launch? Tell us below. Saw this on the eShop earlier and threw it on my watch list. Interested. Played this on PC a while back. It's pretty legitimately fantastic, with a superb OST, fun characters, and a surprising level of emotional depth in its narrative. Highly recommend this to anyone who has never played it. I am offended! Am I doing that right? Do I have to add a bs reason? OMG alcohol and waifus! I won't just not buy it but vilify anyone that does! On a serious note it looks neat. So many games releasing, and so little money lol. For literally one second I thought the picture was a Danganronpa character and I got really excited. THOSE games need to come to the Switch! @SetupDisk do y'all not get tired of being pissed off about opinions other than yours existing? God I love this game. Worth my money and worth playing. I was going to import the Japanese physical release. But if LRG is planning a release then that's one less game to import. wow, this looks amazing! i'll be adding it to my wishlist. Time for my Cyberpunk waifu simulator! @gloom I'm kind of surprised they haven't ported the Danganronpa games over yet, considering they made the jump to PC and PS4 as well. But, yes, they would make a good fit on the Switch. I'd totally buy up a collection with the three mainline games and Ultra Despair Girls on Switch. 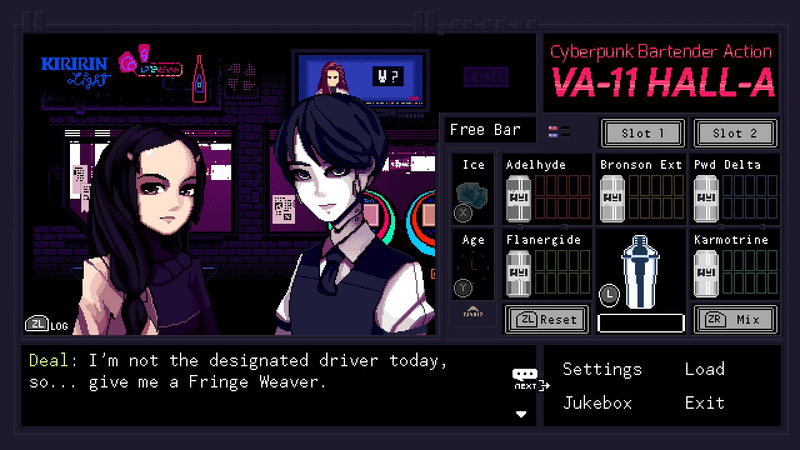 Ysbryd Games: "Let's drive home a message about capitalism being evil!" Ysbryd Games: "Hopefully this game sells well and we make lots of money." Hope Limited Run Games puts a bit more effort into the switch releases. My previous purchases had covers with either awful Photoshop or no cover art at all. @tameshiyaku could you elaborate? Wa planning on buying at Limited Run. Fantastic game. Not in my usual wheelhouse, but dang this was good. Got the limited physical Vita version on this. I liked it. @tameshiyaku I’m assuming you’re talking about some of their releases from a few years ago? I’ve received six of their Switch releases so far, and all of them look amazing, and with the consistent inclusion of interior art and instruction booklets, they’re above the level of the average retail publisher in my opinion. I thought the last sentence pointed out it was sarcasm. 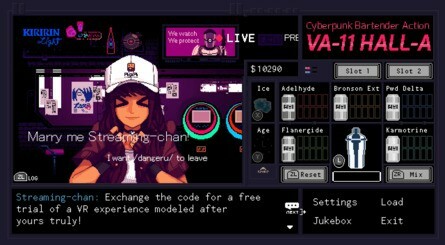 @cacnea310 @Hinade well one of them was va11 hallA for the vita which was passable. It had flipside covers, one was awful the other good. The back has a few pictures slapped on with little or no description. The other game I got was observer for the PS4. That one has a front cover image but the back is completely black. I side there's a inlay that is also just completely black. No controller layout or description of the game... nothing. I bought those two last year. My only switch purchase was Celeste but that hasn't been shipped yet. @tameshiyaku I’ve only ever gotten Switch releases from them, and they’ve never just had blank back or interior art. Some don’t have a description on the back, but they do have one or more pictures (look up Dust:AET and Shantae and the Pirate’s Curse unboxings), and others, like Golf Story, look more like a retail release on the back, with descriptions and stuff. I actually think no description on the back can look nice, especially the Shantae one (it’s really clear and clean looking), but I get why some wouldn’t like them (Dust:AET’s in my opinion could be better with a bit of text). I’m not able to check all mine now, but I would say in general LRG do at least a good job, as long as pictures-only doesn’t bother you too much when it happens. Some of the instruction booklets are thicker and nicer-looking than others, but every Switch game I’ve received has had one, which is better than pretty much all other publishers. Golf Story’s wasn’t my favourite, but Dust:AET’s and Battle Chef Brigade’s we’re great. They always have interior art of some sort. The Shantae interior artwork is one of my favourites, it looks amazing. 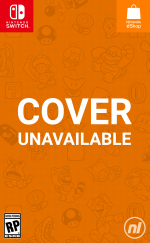 Sometimes, like with Dust:AET and Windjammers, it’s a reversible cover, but they’re exceptions, and recently I think they let you choose which one you want shipped on the outside. 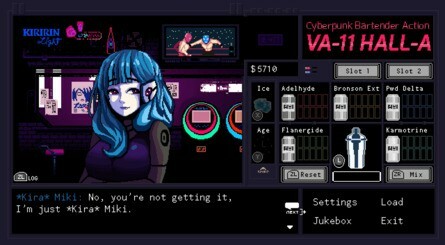 It’s possible that Va-11 Hall-A will have a reversible cover with the Japanese PS4 version on one side and Switch one on the other, although they’ll probably just keep them exclusive to each console version if it’s like Celeste. The quality and style varies a bit between releases, but I always end up liking the ones I get. Some retail publishers can do far worse (Blazblue: Central Fiction, Owlboy, Battle Chasers Nightwar and Mega Man 11 are just a few that got stuck with white interiors). I haven’t seen the ones you said you have, but I know someone with old releases of Rainbow Moon and Shadow Complex for PS4 from a few years ago, and I think the difference in quality from how I remembered them looking (e.g. cover with a title logo and not much else) to how my Switch releases look is huge, so it’s possible they’ve improved from when you got yours too. I’d recommend watching a few of their latest Switch unboxings, like Golf Story, Dust:AET, Shantae, Battle Chef Brigade and Iconoclasts, which all turned out well in my opinion. That way you can see for yourself before you ordered, but I would recommend them, and with Dust:AET being one of my favourite games, I think they did a great job overall with it, better than most other companies likely would have done. I was bummed I missed out on the physical version on PSVita. I kind of dislike the idea of extremely limited physical versions that you have to rush to get before they rapidly sell out and get scalped on ebay. So is this getting a physical release or not??? I asked LRG's facebook page and they said they hadn't heard of it. Dang I was so excited.